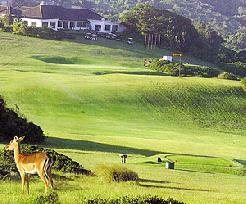 Bushman Sands Golf Course in the Eastern Cape is an 18-hole championship course designed by South African golfing legend, Gary Player. 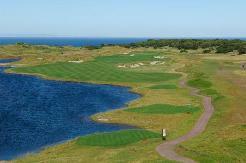 The course follows the banks of the Bushmans and New Years Rivers, resembling the game's earliest "Links" courses in Scotland with undulating fairways and pot bunkers. Unique features include playing the first stroke over the railway line, a double green (1400 sq.m) shared by the 2nd and 5th holes (featured pic. ), crossing the Bushman’s River and New Year’s River on various holes and finishing with a final drive over a small cemetery in the centre of the fairway. A challenging, yet friendly course, to be enjoyed by all golfers.The local community has benefitted immensley from the development of the golf course with many locals being trained as caddies. It is ideally suited for those golfers wishing to combine a wildlife safari in the malaria-free Eastern Cape and there are many reserves nearby offering excellent Game Viewing experiences including Shamwari, Lalibela, Kariega and of course the famous Addo Elephant Park. Features of the club house include: Bunker’s dining room/halfway house, Spa & Wellness Centre including 4 seater Jacuzzi, chill pool, steam room, 3 massage rooms with private shower and air conditioning, Golf Pro-shop, Bar overlooking the 18th green, Gents and ladies changing room facilities with steam rooms, plus a scenic Swimming pool.